When December brings a weekend afternoon with temperatures in the 50s it is a great day to get out for a little exercise. Hiking in the late fall and early winter can offer views of the terrain that may be obstructed when foliage is in full bloom. The Dr. John Champlin Glacier Park in Westerly, Rhode Island, offers a glimpse into terrain sculpted by the advance of Glaciers into southern New England. A hike along the well-marked trails will give you an opportunity to see the ridges and valleys left by the receding glacier as well as breathtaking views of Block Island Sound, Block Island, and Long Island. If you have a smartphone, it is a good idea to take a picture of the trail map you'll find at the entrance points to the trails. The two entrances I am aware of are either off Shore Road or Tom Harvey Road. Parking is available in both locations. 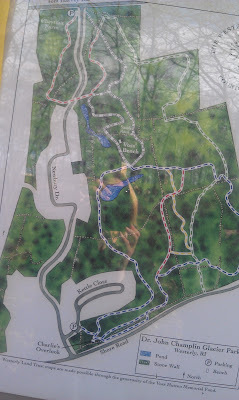 You'll want the map because at various points in your hike you'll find yourself with multiple trail options. It is handy to have the map available to help you make your decision. The trails are well marked, well-cleared and in general, easy to hike if you are wearing appropriate shoes. There are very few obstacles in the way and the inclines are moderate. Be sure to stop, look and make note of your surroundings when you find yourself in a glacial bowl. Don"t miss the Hiscox Overlook for a panoramic view of Misquamicut and Block Island Sound. A walk in the woods in December...it's what's good for the soul. Enjoy other Rhode Island hikes. Nice photos, i love to see those wonderful place even in pictures.. The views are a great motivator for getting out there and hiking.